The holiday season sparkles with promise. 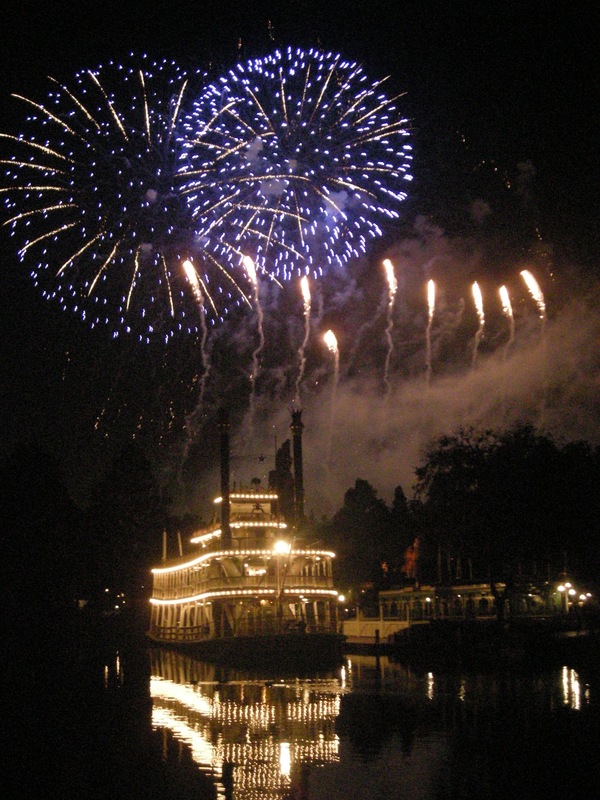 A mystical quality tempts us to peer beyond the veil into a place brimming with never-ending happiness…like living at Disneyland. As children we embraced that joy with our whole heart. But as we grew older and more jaded, we lost the connection with the magic, some turning into die-hard cynics because it never reappeared. The good news is, the magic is still there any time you want it. 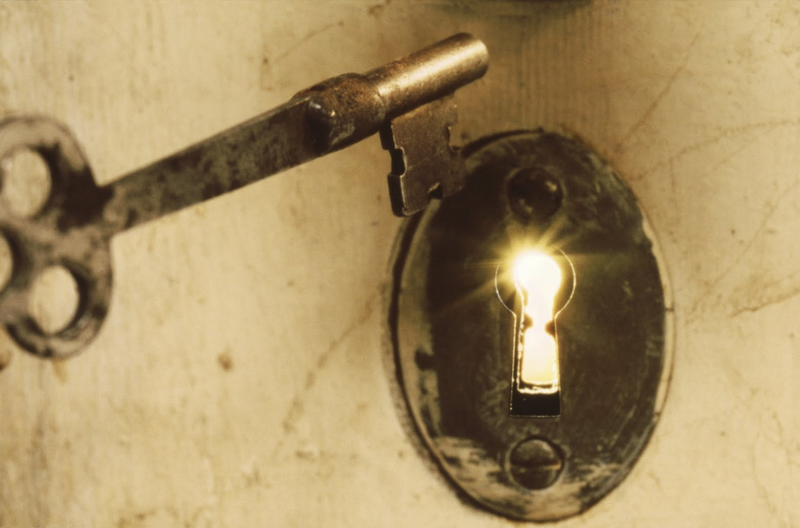 The bad news is, you’ve had the key all along and didn’t know it. Yeah, I know. It sounds like watered down fortune-cookie wisdom. Still, it happens to be true. I’m talking from personal experience too, not reciting something from a Fast-Pass-to-Enlightenment guide. Giving is the focus of many faiths at this time of year, and for good reason. As a teenager, I was suffered the same angst and self-doubt as everyone else. I was a nerdy overachiever with a side of art-geek, who thought happiness lay in chasing a goal. Funny how when I finally got “there”, happiness had already left the building. Sadly, this delusion lasted for years. 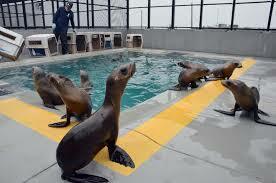 Finally, I had the good sense to volunteer at The Marine Mammal Center in Sausalito, after moving to San Francisco. I thought it would be a good way to meet people with the same interests, which it was. But more important, the experience opened me up to the secret of happiness. There’s a wonderful energy that comes from giving selflessly. Our Sunday Night Crew signed in at 5:00 pm, and in an El Nino winter, we often didn’t leave until sunrise. And we had a GREAT time on our shift too! I’d get home in time to shower and head to work. Magically, the energy carried me through the day…with a smile on my face. If you’re one of the many who don’t have time to volunteer for a non-profit organization on a regular basis, you can do something to “give” everyday. And you’ll be surprised by the happiness you receive in return. Give gently used clothes to local shelters or non-profit organizations. Give towels and bedding to local animal shelters and rescue organizations. For more options for giving to local animal shelters, see my It’s Hard to Be a (Grumpy) Cat at Christmas post. Smile and say something nice to the checkout person at the grocery store. Your kind words will make their day. At the end of a conversation with a Customer Service representative, when they ask you if there’s anything else they can do for you? Say, “Yes. Have a Happy Holiday!” Or, “Have wonderful day!” depending on the season. Perform random acts of kindness, helping strangers in unexpected ways. Leave a copy of a favorite book on a table or bench with a “This is yours to enjoy!” note inside to whoever finds it. There’s a Teen Book Drop event called Rock the Drop I’ve participated in for several years now. Why not spread the reading love all year long?! Use a special talent, such as calligraphy, design, or organizational skills to help a non-profit organization promote an event. The truth is, the more you give the happier you are…and the more you realize you have to give…in ways you never thought possible. It costs so little and the reward is priceless. Here’s to magically Happy Holidays, and a Happy New Year too! 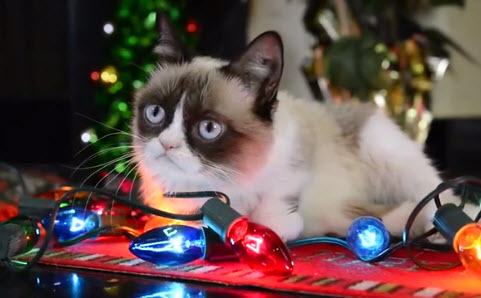 It’s Hard to Be a (Grumpy) Cat at Christmas! A couple of years ago Grumpy Cat, Oskar the Blind Cat, Nala Cat, Colonel Meow, and Hamilton the Hipster Cat starred in the following video that helped to feed over 500,000 homeless cats. While the view-and-feed-homeless-cats offer for the video is long past, the sentiment of helping those less fortunate still rings true. Especially at this time of year. You don’t have to sponsor thousands of meals to feed homeless animals in order to make a HUGE difference. Donate a bag of cat/dog food to your local Humane Society or animal shelter. Sometimes there are even “donation” bins at local pet food stores for local shelters and rescue organizations. 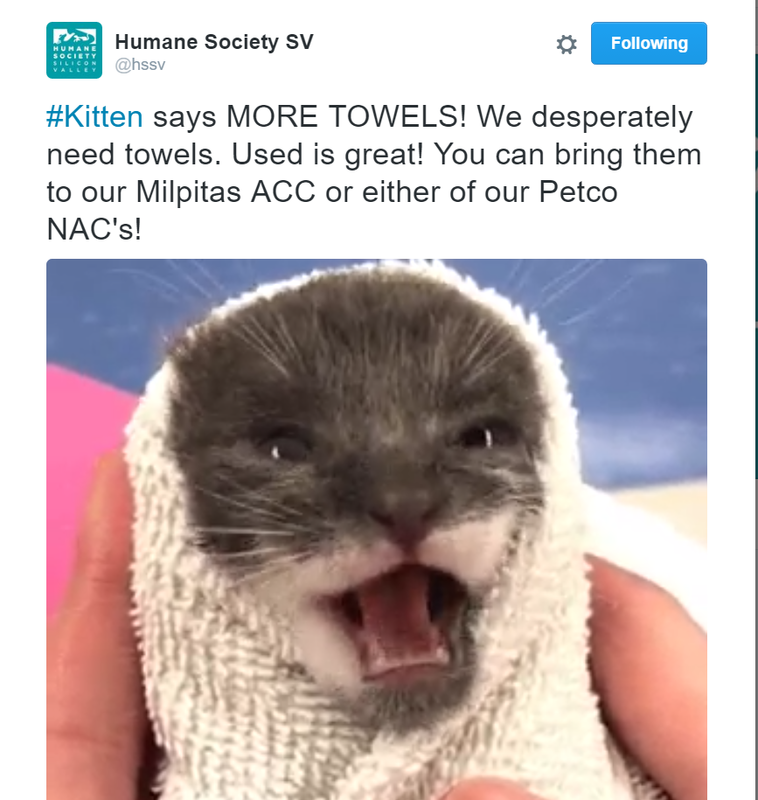 Give those old towels you were about to throw away to your local animal shelter. They always need towels and other types of bedding material. Shelters always need disinfectant cleaners, bleach, newspapers, and paper towels. Next time you’re out shopping, buy extra to donate to your local shelter. If you don’t have time to shop and deliver goods to your local shelter and know your way around the internet, you can shop the discount stores, like Costco, and have the items delivered for a small fee. Donate your time. Shelters need volunteers in all capacities. Best of all, open your heart and home to a homeless or rescue animal. They will return the love one hundred-fold. 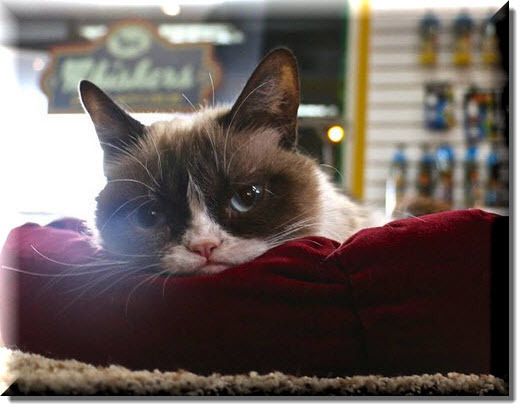 Grumpy Cat says: Watch funny videos and feed cats in need! Grumpy Cat can try to hide her true nature behind that frown, but she doesn’t fool me. Not one bit. Her recent Instagram shout out about the new Friskies YouTube channel that’s helping to feed hungry cats proves that she’s got a heart of gold. Friskies will give 1 can of wet food to charity for every new video view and 2 cans of food for every new YouTube subscriber during the month of January (up to 100,000 cans). It’s easy! And so much fun! Click the Subscribe button in the upper right corner of the window, follow the prompts (if you haven’t already subscribed to this Friskies YouTube channel), and 2 cans of wet food will be given to feed needy cats. Click a video, laugh as you watch through to completion, and 1 can of wet food will be given to feed needy cats—for EVERY video you watch through to completion. Watch as many as you can before January 31st! Feeding needy cats couldn’t be more fun! I was going to kick off summer with a light-hearted Sun, Surf, and Seals post that included a mention about the Leave Seals Be rescue campaign — sponsored by the Marine Mammal Center in Sausalito, California. That is, until I heard about the crisis facing sea lion pups in California. Southern California beaches have received the majority of the stranded pups. The Marine Mammal Center in Sausalito stepped up, and is taking care of a good number of the starving pups to alleviate overcrowding in the Southern California rescue facilities. While the cause of the problem is thought to be lack of the natural food source for these marine mammals, The Marine Mammal Center is looking into other possible causes. Their research includes screening for toxins and other elements. Why all the fuss over a bunch malnourished baby sea lions? This degree of crisis could be a warning sign for a much bigger problem that would impact the human population. Determining the cause, is the first step in finding a preventative solution. In the following news clip, Dr. Shawn Johnson, Director of Veterinary Science at the Marine Mammal Center, explains this distressing phenomena and his approach to solving it. It’s been a few years since I volunteered at the Marine Mammal Center (in animal care), but I’m still a strong supporter. I know first-hand how dedicated these people are, and all the good they accomplish. For these undernourished sea lion pups to have a chance at surviving in the wild, they need to eat a lot of fish, starting with the essential Fish Smoothie and working up to buckets of whole fish. The hungry patients are going through approximately 4,000 lbs of fish per week (at $1.00 per pound) – double the usual amount due to double the number of residents in their care. To help the Marine Mammal Center continue their research and care for the stranded sea lion pups, you can go here to donate. 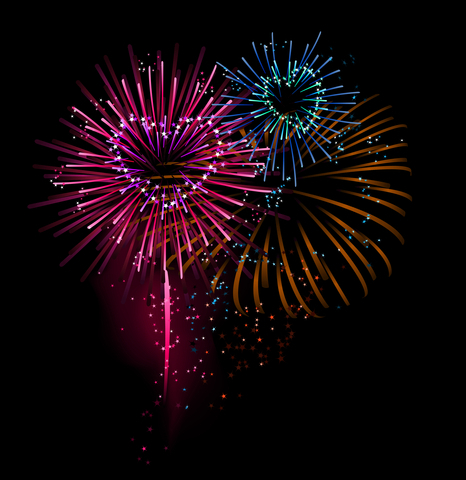 Tweet as often as you like between now and midnight on the 4th of July. For every #fish4pups blog-link tweet, I will donate $1.00 to the Marine Mammal Center food drive. $1.00 = 1 pound of fish for starving sea lion pups! The sea lion pups thank you! The San Francisco Symphony’s (SSF) annual Gala opened the 2013 season with a glittering splash Wednesday, September 19th. 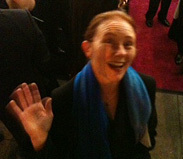 I’m a writer, so you’d be right in guessing that mingling with the high society see-and-be-seen set isn’t my usual thing. But I made an exception for the SSF Gala, and got out the evening gown and put on my big girl shoes. Because of my passion for writing for young people, I feel supporting education in all the arts is vitally important. The proceeds from the SSF lavish Gala benefit the symphony’s education and community programs, that provide music education to more than 75,000 Bay Area children each year, including the San Francisco Youth Orchestra. 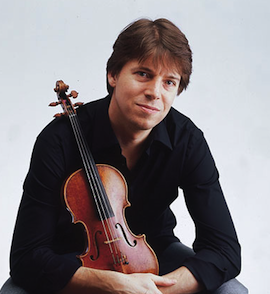 Which is why it was no surprise that world-renowned violinist, Joshua Bell, headlined the event. OK, I admit I’m a fan of Joshua Bell’s music. He brings a certain physical energy to his performances that elevates and enriches the music beyond the actual notes. As corny as it may sound, listening to him play is a spiritual experience for me. And I’m guessing I’m not alone in there, because Davies Symphony Hall sells out every time he plays there. Trying to reach kids is very important to me, not just so they can be the next professional musicians, though some will; it’s even more important that they just have music in their lives. Participating in this event was a huge reminder that we all can all do something to benefit young people in our communities. Whether it’s helping out at our local library, working with the youth theater or youth orchestra (in any capacity), or supporting other local art programs. We don’t have to be famous to make a difference in young people’s lives, we just have to care. The Opening Night Gala musical program was awe-inspiring, then the after-party rocked. Big time. Don’t let the symphony’s “proper” image fool you. Those folks know how to throw one heck of a par-tay! Grove Street, along side Davies Symphony Hall, was transformed into a carnival filled with street performers and kiosks over-flowing with sweet and savory treats. But that wasn’t all. A massive tent spanning half a city block behind the symphony hall, staged live bands where the crowd danced the night away. Not that I stayed that long. I had to get home to two diabetic cats who needed their insulin shots. But don’t feel sorry for me. 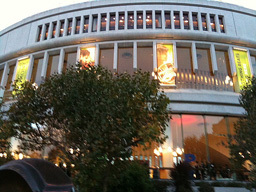 As you can see in the photo taken by the VERY TALL man in the tux (juggling in the photo above), I had a terrific time! What’s your passion for giving?